Greetings once again, small humans of Michigan! I, HOCKEYBEAR, destroyer of planets, planetesimals, continents, nations, states, provinces, universities, colleges, etc., am pleased to announced that I will be writing a guest column at the Hoover Street Rag during college egghockey season! Sometimes, as I curl up in my den to relax after completing a destructive mission of vital importance, I think back to the fear and trembling I leave in my wake, which leads my to think of Fear and Trembling by Søren Kierkegaard - a great northern soul, just like HOCKEYBEAR - and I ask myself, "Is it all worth it, HOCKEYBEAR? The destruction, the collateral damage, the smoking craters? Wouldn't it be better to just relax in my den, venture out occasionally to eat every part of some Chena River fish and some locally-grown potatoes, and pursue a life of quiet contemplation?" 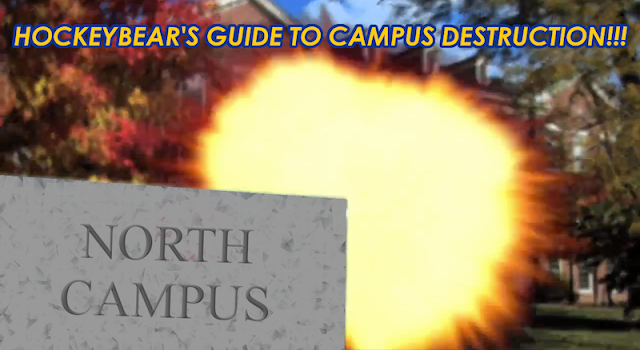 HOCKEYBEAR's Guide to Campus Destruction! The naive reader may think that my first column will be about how to destroy the University of Alabama, the first opponent the small humans of Michigan play in egghockey. But that is not the case: HOCKEYBEAR has no interest in your dull egghockey rivalries. The University of Michigan is clearly superior to the University of Alabama in Tuscaloosa because it has a high-level hockey team, and Alabama does not. The finest institution of higher learning in Alabama is Alabama-Huntsville, a school that bravely tries to compete in the highest levels of college hockey despite being located in a sweltering southeastern clime. Instead, the first campus I shall destroy in my column is one that will hit close to home for many readers from Michigan, but fortunately, an adequate distance away from home itself: North Campus shall feel my wrath! So here's the deal. I was working on this and I was going to do the usual five-five-five-five presentation but then my hard drive on my six week old computer crashed. So you're getting what I could pull out of the fire, so to speak, as I get everything back to normal. I would note CrashPlan is worth its weight in gold. Little secret, as screwed up as it may be, Back to the Future is still one of my all-time favorite movies. Part of this is the main theme and the way it builds upon itself. It's grand in scope, yet has little moments. Back to the Future is also the theme of this year's MGoMix because it is, to me the theme of the 2012 Michigan season. Last year was about righting the ship, fixing something in the past that made the timeline in the present the way we knew it to be, Now we're back, we just need a Mr. Fusion to look a little further ahead. Plus, you know, Denard leaves little flame trails behind him when he hits 88 mph. The Black Keys are from Ohio, but like Michigan football, we take Ohio's best and make it our own. Well, having heard it over and over on the NCAA Basketball tournament and now in film trailers and such. It's such a wonderful follow up to our inclusion of "10 AM Automatic" a few years back. "Oh, it's good to be back." As we learned from Iron Man 2 and The Avengers, this is Tony Stark's personal theme. Plus, you know, tons of people have AC/DC on their college football playlists, but it's almost always "Thunderstruck" or "Hell's Bells", so I am trying to mix in something else. Is it a 1990s indie classic, or the theme to Pardon the Interruption? We still don't know. Because I needed to turn the Michigan football season into a Wes Anderson film. Because I needed some Seger in this mix, it's required by Ann Arbor city ordinance. "I wanna pull it apart and put it back together, I want to relive all my adolescent dreams. Inspired by true events on movie screens, I am a one man wrecking machine." Or, you know, Craig Roh. We'll be glowing in the dark"
Hmm, getting the legendary 1990s band back together for one of the biggest things of 2012? Yeah, I'm projecting here. Great song and it sounds great in the mix. I recommend it highly. I don't know which mix I have of this, but this is clearly on here in honor of the UTL victory last season. Let's do it again under the lights in South Bend. In honor of Brady Hoke's favorite run tactic and as a warning to college football and the NCAA in general. "No one man should have all that power." "Daft Punk is playing at my (Big) house." Which raises the question, why isn't more Daft Punk being played at my Big House? Yes, I needed to get some Reservoir Dogs in this reset as well. I'm clearly feeling my college years. I know that "Another Son/Daughter" is the unofficial anthem of Michigan football of recent vintage, but I will make an argument for this being the perfect anthem for now. Book ending our Back to the Future theme. "So take me away, I don't mind, but you better promise me I'll be back in time." More known now as the backing track for a Budweiser ad that ran during the Super Bowl, still one of my all-time favorite 1980s tracks. "We're so glad to see so many of you lovely people here tonight and we would especially like to welcome all the representatives of the Big Ten officiating community who have chosen to join us here in the Michigan Amphitheater at this time. We do sincerely hope you'll all enjoy the show and please remember people, that no matter who you are and what you do to live, thrive and survive, there're still some things that make us all the same. You, me, them, everybody, everybody."